UK Government shovel ready snow program: "dig yourselves out" | Watts Up With That? UK Government shovel ready snow program: "dig yourselves out"
Council chiefs have sparked outrage after proposing residents dig themselves out of the snow as Britain braces itself for another winter of Arctic conditions. As long-range forecasts suggest the country will be hit by blizzards and temperatures plummeting to -20c, bosses at Camden Council prepared to hand out spades. But their solution to the bitter weather has been slammed by those who remember the headache of last year’s gritting crisis which brought widespread disruption and left people trapped in their homes. The north London council’s proposal involves a ‘self-help’ scheme in which people can ring and request a shovel. The authority plans to give out more than 2,000 spades to community centres and groups, shopkeepers and families to help clear clogged-up roads and pavements. Eleanor Botwright, director of Castlehaven Community Centre, said: ‘It is not quite dig your own grave but it is a double-edged sword. The coming winter is worrying many in Britain, and it seems that such “shovel ready” programs really don’t help that worry. The MetOffice might lift spirits if they forecast a BBQ Christmas. October 8, 2010 in Government idiocy, snowfall, Weather. Don’t think so, old boy. That would terrify even the Warmistas into buying long-johns. Of course, we’ll still hear all about how it’s special warm snow that increases the temperature anomaly. Let them eat ice cream, they didn’t like the cake last year. If it weren’t so serious it would be comical the ways in which socialism fails. Because, you know, the entire reason for government is to provide free retirement for the lucky few. The MET office models predicted exactly this outcome. The more the globe warms, so the more it appears to be intensely cold, and the more shovels arrive on ones door step. The number of shovels will be inversely proportional to the square footage to be shoveled. Additionally, this will almost certainly turn out to be the ‘wrong sort of snow’ for rail, air, and submarine transport. The resulting shutdown will last until blueberries are exhausted and biscuit supplies are perilously low. This is really not a bad idea. It would be whole lot better if the British people weren’t already taxed to death, but as a money saving exercise it has merit. Of course they might have an issue with all the heart attacks that result from a bunch of out of shape Britons suddenly doing manual labor, but they will have clearer roads and sidewalks. I was down in deepest Sussex last week and spoke to some of the local farmers. The view held by all was that this will be a cold winter (because a cold August and September combined always means a cold winter) but with little chance of severe cold until Christmas (because the hedgehogs are not yet preparing their hibernation nests). These old boys don’t need computer models and temperature anomalies, experience of what actually happens in real life trumps any theory. As for councils handing out shovels, for goodness sake when will these idiots grow up and realise we can cope quite adequately without our taxes being wasted providing “free” shovels? They’ll be offering to come round and wipe our bottoms next. Didn’t they hand out light bulbs at one point, that didn’t fit the sockets or something? If the people in the US know that a hurricane is coming, they board up their windows… with plywood that they BUY FOR THEMSELVES which costs much more that a freakin’ shovel. Wow, what has happened to the world? Please be clear that the long range forecasts there quoted are spin without credibility or track record of success and should be ignored absolutely. We, WeatherAction have issued no forecast and await a sponsor to enable the public to know. Perhaps some readers will invite politicians in Government or Councils to purchase our winter forecast or sponsor it for public consumption and enable everyone to know whether or when and where shovels might be needed. We made public warnings last winter of UK & Europe ice & snow and that road salt would run-out which were ignored with consequential road accidents and deaths. Meanwhile on Oz, where winter snow falls mainly on a few southern mountains, shovels are well known. A team of Council workers took their truck to a n excavation site, to discover that someone had forgotten to load the shovels. The foremean phoned the Engineer at base, who said that he would send out another truck with shovels. After decades of pinko-lefty-scocialist polilices being introduced in the UK, and dumbing down of the education system, where the “people” want the Govn’t to “do something”, this is the result. People can’t think for themselves and expect someone else to do something, equals the Nanny state. Sadly, this is happening in New Zealand and Australia too. My wife has never seen snow or experienced real cold, like -20c with wind chill of another -20c, so maybe next winter here in Aus I’ll take her to the mountains….he he he he….she has no idea what she want’s to let herself get into. “Snow will be a distant memory.” Now who said that? I have my own shovel and several spades as well so maybe “they” could give me the cash instead HA HA! You have to take what is given when it is given and be grateful weather you want it or not and don’t ask why your money is being used in that way, it is their largess not your tax. Government spending is limited these days to bread and circuses. Snow removal is neither. The only reason the council is providing the shovels is they got a good deal on them when one of their cronies had an end of year sale. Here is a picture of a couple proudly showing off their council provided shovel. The flaw in handing out shovels is that some people will do their “civic duty” and others won’t. What should a driver do when the streets are blocked and there is a matter of urgency to attend to? The answer is simplistic for anyone who lives in a winter city and has to deal with real cold (-40 PLUS windchill, not -20 which is actually a nice day in January in my neck of the woods) and inadequate snow removal equipment. Winch on the bumpers (front and back). 24 Volt booster battery with 10 meter booster cables. I just finished servicing the snowblower. My landlord brought in and serviced the truck-mount snow plow. The tractor/front-end loader is next on the list. I’ll be positioning the snow shovels. The tire chains are ready. We do this every winter; it’s normal, standard procedure. And these people are whining because they’re being offered shovels to clear their own sidewalks?? The problem I saw when I lived back East was that once someone dug out their car and cleaned out the parking space, it became “their” parking place and they would often defend it violently. Many arguments over such parking spaces would turn to fisticuffs or vandalism. When someone works pretty hard to clear out a space, particularly a “mouse potato” who isn’t used to working hard, they aren’t going to take kindly to digging out another spot. Add in some of the “holiday spirits” and things can turn ugly. I don’t believe it is in the best interests of the local government to have citizens digging themselves out unless it is a real emergency situation. crosspatch said: Government spending is limited these days to bread and circuses. Snow removal is neither. – I don’t know, two winter’s ago when Seattle was hit hard, the city government did a dandy job removing snow from the mayor’s street. But won’t it be rotten snow? Here in Brisbane, Australia, we have just had the wettest September on record – the Warmistas kept telling us we would run out of water – most dams are full (though Toowoomba is only at 21% still) – and now in October is is just raining, and raining, and raining. We will probably crack the October record as well. Two months? Is that still just weather??? The Lefty twits are crying into their soy milk and low fat meusli, wishing the drought would come back. Gaia has let them down, big time. But Camden = Franny Land, chock full of chattering wonks responsible for what Patrick Davis refers to above. What else do you expect? Last winter the council closed all the parks and reckoned they couldn’t use snow ploughs because of the anti-car speed-bumps all over the place. Don’t judge the rest of the country by this sad bunch of Guardian readers, most of us are rather more practical and self-reliant. Some of us even own a shovel! Suggest US readers take a tour of the place via Google Street View to get a feel for the sad existence these folk must lead. Is it any wonder they worship polar bears and think the sky is falling in? I thought this was the time of year where the MET says it’s going to be an extremely hot winter. What’s going on here? Sounds like a reasonable solution. Either they dig themselves out, possibly losing weight in the process, or they don’t and starve. Looks like they are in for some weight loss this winter!! I am assuming the Eco-Nazis will not allow them to use gas snow blowers of course!! I’ll clear my path when they dump that stupid law and people learn to watch where they put their feet. To be fair Joanie, the proposed shovel distribution isn’t a UK wide proposal, it is only being suggested in one borough of London. You have to bear in mind that London effectively shuts down when it gets more than 1 inch of snow, as (probably due to the considerable UHI effect created by 10 million people) very few of the inhabitants have any experience of driving/walking in snow or ice. Those of us who inhabit more northerly extremes of the British Isles (i.e. the Scottish Highlands) can usually get about and function in -20C and a couple of feet of snow without the need of a state of emergency declaration. But even we struggle compared with how the Norwegians and Swedes stroll along at -30C and worse. It’s what you are used to. IIRC some of the citys/towns in north-west Canada spend 30% of their total budget on snow clearing, I’m guessing but in the UK the average would probably be a fraction of 1%. It should be noted that the death rate here rises rapidly after snowfall – older folk keen to clear the snow from their drives often suffer from heart attacks as they exert themselves too much. Half the comments here are funny for their lack of knowledge of the UK. When I was a boy in the 1960’s and 1970’s we and all our neighbours did dig out the snow and clear the roads (it’s called the blitz spirit). As snowfall in the UK never lasts long we have very few snow ploughs as it is not cost effective. What has happened is that we have had 25 years of very little snowfall so people under 35, don’t remember this. Over the last 3 years every time it snows I clear a 50 metre footpath outside my house to the main road and I don’t expect the council to clear it as it would again not be cost effective. My strong hunch is for another hard winter. 1. First snowfall in the Alps down to 1500m in August and a second similar fall in September. The earlier this happens, normally the harder the winter to come. 1981 in Austria saw 30cm+ at 800m in mid JULY. I know because I was on exchange that summer and came into breakfast to see all the snow on the ground. The first big winter snowfall that year came at the end of October, with up to a metre falling that early and staying. The snows left the farming belt in late April in 1982. 2. Rich and early blackberry crop in SE England. 3. Magnificent blooms of berries, rosehips etc etc, indicating a need for the squirrels to build up big stocks in their dens for the winter to come. The squirrels are seen more regularly and in greater numbers at this time. Smart cookies, squirrels. 4. 1984/5 and 1985/6 were horrendously cold in Cambridge, I put my 5 season winter bag inside my bed to keep warm when at college and the Cam was ice for 6 weeks – we are at the same stage of the solar Hale cycle now. 5. El nino headed toward La Nina. Always helps it get a bit colder. 6. Joe Bastardi’s thoughts are always worth taking into account. He reckons another hard one too. 7. I await what Piers Corbyn has to say with interest. I’d be surprised if he went for a mild one, but he knows his science and his methods better than I do, so we’ll wait and see. I’d go 60 – 70% confidence on a hard- to really hard one and less than 10% that we get no snow lying in SE England through the whole winter. Piers Corbyn has his forecast ready for the winter. He needs a commercial sponsor to release it. Has anyone got any spare cash. Considering the previous accuracy of his forecasts, you would think Camden Council would be paying up. It’s not far from Camden. Here’s a country at fifty something degrees north, and people don’t have their own spades? I wish global warming was here now I live in sydney and I still have the heater on , and our govt is looking to start the ETS and all our power bills will double GOD SAVE AUSTRALIA . WE NEED HELP TOO TURF OUR LABOUR GOVT OUT . Steinar – we have spades in Scotland. And I am sure that most folk in the English countryside do also. It is just the southern townies that are incapable (they are probably too busy sourcing imported blueberries). 10/10 – just in time for a snow warning across the South Island of New Zealand, a month and a bit away from summer. And from a Southern Hemisphere heading towards summer, a late-snow story from Mount Hutt – went for a final-Saturday schuss with the grandkids, and spent the day in semi-whiteout at 1500m, with 3-5cm of nice new white stuff to – er – schuss on. Very hard to ski gracefully without reference marks, and Cold! Snow caused by the usual suspect – a deep low which swept very cold air straight up from Antarctica. Hey ho. Sir, I know not which part of darkest Sussex you visited but where I live in Sussex the hedgehogs have booked into all of the hedgehog dens I have concealed about my garden. Each den has an occupant quite ready to defend their tenancy against all comers! I think something not being taken into account here is the cultivated incompetence of the English in the snow. It’s happened so rarely for the last couple of decades that everyone wants an excuse to take a day off work when it snows. It was amazing how everyone stopped fannying about last year once the novelty had worn off and they started worrying about getting paid. Forgive me. I’m a cynic. 1.) The shovels were purchased from China at a bulk rate (15 pence each) by Politician A’s brother-in-law, and then purchased by Politician A at a higher rate (95 pence each.) Then an administrative fee was added. Politician A’s son-in-law was paid to hand the shovel’s out, as Assistant County Subdistributor. Total cost to taxpayer for “free” shovels: 5 pounds 85 pence each. 2.) Politician A is running a State Operated factory, which only stopped making brooms and switched to shovels when the snow melted last April. They now have a huge surplus of snow shovels, but the fact they have made shovels is almost a sure sign there will be no snow this winter. In either case, the shovels will be cheap and break after ten minutes of use. If you want a job done well, let the private sector do it. I don’t get what the “outrage” was about – after all, most able-bodied people are perfectly capable of digging snow – preferring self-reliance over Government-dependence – and it would leave the taxpayer better off. I would also suggest we can provide our own bloody shovels. I suspect it is the Council diggers who are outraged. Are you for real? PM Cameron may be a Tory, but he’s as liberal as anyone on the Labour bench. The days of UK Conservatives promoting individualism, free trade and small government are long gone, now replaced by Green propaganda and “Hug A Hoodie” campaigns. And the Lib Dems? They’ve always been ultra liberal left-wing. Your statement is completely false. Our current government is a socialist one. I have a friend in Houston who said it flurried for awhile late last winter, and everyone panicked even though it wasn’t sticking. Know you are joking, and that Houston normally never gets snow, but you do never know. Nah, we’ve got the Gulf Stream! Actually, despite the Daily Mails hysterical announcements, snow in London is not that common. This is old England, not New England. London is more typically mild, wet and misty as anyone who has visited that fine city will tell you. I’m not sure why shovels are being given away, but lets get this in perspective. 1) The Council has stated that these shovels will not replace snow clearance and gritting on roads and pavements. 2) The shovels are available on request , to be returned after use. This is in keeping with an idea of give the people the tools and they will help themselves out of any mess. 3) It is likely that as the climate in the UK cools and we get regular snow falls, people will adapt and have a store of appropriate tools. 4) These issues have to be seen in the context of the UK having a liberal democracy and welfare state. Examples such as the NHS are born out of this philosophy. The Daily mail is a propaganda sheet for the hard right in the UK and has been campaigning for an end to this type of government for many years, even to the extent of support ing the Nazi party at the time. They feel government should rule on a basis of everyman for himself, but that is not within the UK character. Our liberal democracy will always lie somewhere between totalitarian authority and complete liberal anarchy, in other words a mature democracy. And as a result, if a Council occasionally makes shovels available to those who are unprepared for our notoriously unpredictable winter, it’s no great issue, there are many other things to get more wound up about. My advice is to think as carefully about the accuracy of Daily Mail stories, as one would with regard to Guardian climate change scares. Phone rings next January at Camden Council offices. There’s is something more epic going on here not mentioned. We’ve gotten used to the UK media just shouting ‘it’s going to be record hot every year every season’. Now for the 1st time, they’re not doing it. This could be a sign there has been a decision made at the top e.g. ‘ look, britain is getting colder, we need to face that sooner or later, we’re losing the mass public’s trust. We need to make the switch to the story ‘ GW causes gulf stream to be diverted, europe loses heat source ‘. This story has always been around, at least since the start of the GW campaign, and now would be a sensible time for them to promote it to ‘excuse of 1st resort’. Arctic signals that control movement of the jet stream are similar to the last autumn negative Siberian end (Kola) SST anomaly, while Greenland-Hudson Bay positive. This pulls jet-stream further south which would bring colder weather and strong precipitation (snow) in Northern Atlantic. Since last October the Hudson Bay – Siberia differential has deteriorated by another 94 nT, due to the Hudson Bay’s intensity further weakness. When I lived in Sweden, I was told that it was a legal requirement for houseowneres to clear the snow from the footpath along the full frontage of their property. This in a part of the country where 50cm would be normal. as we view climate change comments from the Guardian. And remember, the UK is not the USA, we have a much more entrenched middle of the road political tradition, and to us any administration in the USA whether Republican or Democrat would be viewed as pretty right wing. We have to view such information not through the rabble rousing gutter press, but through the traditions of that country. Although ( dare I say it) it would be nice to keep this as a climate debating and information site, as opposed to a site for the promotion of right wing political values. Of course it runs on petrol. Somewhere in my papers The MET Office predicted the opposite now stated. It is fairly straightforward for one person to give an often more reliable seasonal forecast than the MetO, by use of look-backs of a set number of years where the circulation patterns were similar. It can fail badly at times though. Astrometeorologists go further, and look at the astronomical cause of the temperature changes. We are largely looking at a milder period from later in December and through most of January. I think some Norwegians would see it differently. Norwegian railway hasn’t impressed many the last few years. kwik: I have one of those also. Bought it last year and that wasn’t a minute too early. I hope there will be enough aid for the elderly, incapacitated and needy during this harsh winter coming up. Meanwhile, people such as Prince Charles have the luxury of others servicing their needs while promoting one of the biggest lies of our current generation. Make the scion of inbreeders live in a small flat and fend for himself without servants tending to his every need. Will council be sending out hats and mittens too? After moving to New Hampshire many years ago, I realized quickly that the fastest way from snow to no snow around my house was a non-carbon-neutral gas-powered snow blower…and generous amounts of ice remover (aka salt) when needed. The UK Met Office has given up on long term forecasts as it was getting them so wrong it was a Laughing Stock, they were consistantly slanted towards supporting CAGW and hence counter productive after climategate. So we are left with Piers Weather Action and this new mob Positive Weather Solutions, who the Daily Mail quote in the full article, have never heard of them and can’t verify their claims on past forecasts. Await Piers’s forecast with interest, another Winter like last year will kill CAGW in the UK for years to come. Teach a man about why they need shovels and they will be wise for a lifetime. Apologies for the repeated themes in the posts by myself, I thought the first one had been deleted! The geomagnetic pole is now moving at 55 to 60 km per year. As an aside the South Atlantic geomagnetic anomaly is strengthening. Last year councils wre scaring us into not clearing the snow in front of our homes, in case someone slipped on the result of our efforts and sued. So one hopes the council realise the liability they are now incurring by not only encouraging but actively equipping residents to go out and wield these double edged swords. a concept which itself would benefit from a large shovel. I’d suggest that many of the people commenting know little or nothing about the UK, its government and what its people want from the government. For those who want to learn, I’d commend the posts by Gareth Phillips and Byz as a starting point. I’d be fascinated if you could give us an example of a UK politician running a “State Operated factory” making shovels, or indeed anything else. I think you might be mistaking us for North Korea. Are there any graphs/data about the flow rate and temperature of the Gulf Stream? If so, could they be posted like the “Sea Ice Page”. Maybe we could make our own predictions about the English/European winters, and the number of shovels needed. I’ve got a spare five Australian Dollars which, the way exchange rates are going, is going to be equivalent to about £1,000,000 in a year or so; but still wouldn’t buy a decent daily newspaper in the UK. Never mind the bloody winter. I’m planning a trip to Europe in May/June and want to know if I should budget for thermal underwear or just the usual wet-suit rental. I think his official forecast is not due till the 15th Oct.
Why can’t we outsource the digging to India, like we have with all the other UK service industries? Those of us that line in northern continental climate zones think this is all very funny. Funny in a sad ironic way, of course. Let me think, Baden Powell, you know the “be prepared” guy. Wasn’t he British? We’ll see if that was a waste of cash – next spring! Gulf stream varies greatly from 100cm/sec along Florida coast to less then 20 cm/sec (as low as 5cm/sec) to the SE of Iceland, it also varies with seasons. I can’t remember an autumn when someone didn’t predict a savage winter to come. It’s the same every year. White man he chop heap big heap wood…. OK, you clear off your sidewalk, then what. Are things so bad in the UK the government has to pass out shovels. Or does it have to make sense. If I understand the Tinsley and Yu’s paper, changes to GCR intensity and relative pattern of GCR intensity (The GCR intensity is greatest at the pole.) affects winter storms and wind patterns. The geomagnetic field intensity and pattern therefore affects wind patterns indirectly rather than directly. If I remember correctly there were hurricane strength winter storms in North America during previous deep solar minimums. President Carter declares national state of emergency due winter storms. I am surprised they did not command the subjects to FIRST dig out the public welfare council housing and only then allow them to clear their own privately owned homes. After all, the pitiful helpless clients of the state should come first. That is all fine as long as you believe that the GCR counts are OK, but I don’t think they are. Fig. 2. The estimated annual average heliospheric magnetic field strength near Earth, 1428–2005, based on the inter-calibrated cosmic ray record. It closely matches CETs, but it is suppose to show strength of the sun’s magnetic field. It does that only in the last few decades, since space measurements are taken. The rest shows how heavily the GCR count is affected by the weather and other terrestrial conditions (volcanoes etc). Now take a look at period around 1800, it is not at all like sunspot record. 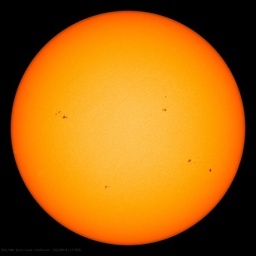 which at least looks something like sunspot record of the period. What’s the problem with digging yourself out of the snow? And since when is it the government’s job to provide a friggin’ shovel? Wow, what a bunch of entitlement-minded, crybaby wussies the Brits have become. No wonder developed democracies/republic are failing spectacularly across the world. As for the elderly/disabled who cannot do it themselves, shouldn’t the younger folks of the neighborhood be helping? I know I shoveled out my elderly neighbor’s driveway and sidewalk routinely when I was a kid. And I’m a girl. No, wasn’t paid for it, unless you consider the cup of hot cocoa, homemade cookies and appreciation of an old lady “wages”. Just did it because it’s the right thing to do (plus, she made the best cookies ever). My uncle also took his home-made snowplow around and did driveways when it snowed, as did many of the people in my home town. That was back when we lived in communities and neighbors helped neighbors, I guess. Well hopefully not appearing too mercenary – how much? I wasn’t so altruistic. I headed out early after a storm and knocked on people’s doors. I didn’t ask a price; I just shoveled the walk and took what was offered. Of course, one figured out pretty quickly which people paid well and which people were the cheapskates. That was one reason one headed out early: One wanted to hit the better paying people before some other kid-with-a-shovel did their walk. After around four hours of ruthless, cut-throat capitalism I headed home, peering through the snow-covered bushes to see how far my older brother had gotten with our own driveway. The trick was to arrive just before he finished, and help him for fifteen or twenty minutes, and walk into the house with him. That enabled me to create the illusion I’d helped him out with our long drive, and to bask in my mother’s approval. About thirty years later there was a boy who shoveled the walkway to our local Town Office, and also the Grade School. He was a ruthless cut-throat capitalist, and reminded my of myself when I was a boy, but he ran into problems I never ran into. The grade school stopped using him because the janitors got angry about “losing work,” and the Town Office stopped using him because their insurance company stated he was too high a risk. It made me feel a bit sad that a kid couldn’t even make extra money shoveling walks, but now it is twenty years later, and perhaps things are coming around full cycle, with the government handing the shovels back to the people, who might well hand the shovel back to the kids. Now, if we could just get the insurance companies to realize exercise is good for kids, and obesity is the risk, they might even let children go outside after it snows. You never tasted the cookies. 🙂 Cash is good too, but those cookies were to die for! 1. Bob Diamond, Barclays – getting his folks to Canary Wharf through the winter. 2. English Premier League – contigency plans for postponements. 3. RAC/AA – they might want to plan for being inundated……. 4. Eddie Stobart – he’s got a lotta lorries to shift around the UK’s motorways. 5. Toboggan importers – how many to prepare to shift this winter? 6. Utility suppliers – planning for high systemic uses if necessary. 7. Helly Hansen/Berghaus etc – market opportunity to sell more thermals, down jackets and other forms of warm winter clothing. Not to hard to think up a lot of them. And this new government claims global warming as a good reason to cut winter fuel payments to pensioners. Many things are done in the name of Society. Often the choice of such words in a title just gives the lie to it. It’s the 2nd ‘D’ in DDR (for East Germany) that always got me. In olden times it tended to be God’s name that was invoked to make a cause unassailable, while today it’s typically something about ‘saving the planet’. Oh, dear….you are not too familiar with that other curse of British society these last few years. Such behaviour will surely result in a very early visit from the social services people (with police support) as this is clearly child abuse. Prison for the parents, and a foster home for the poor abused child. Weather forecasts on BBC from The Met Office, used to be delivered by Qualified Meteorologists like Bill Giles, Suzanne Charlton, Michael Fish and the superlative John Kettley. These days The BBC wheel on bimbo airheads, who “wannabe a presenta”. Being the BBC, they are manner of colours genders and accents, many of whom are quite inarticulate, but that’s PC progress for you. Yesterday, the airhead presenta, promised me a sunny 20C high. It was between 10 and 13C, and foggy all day. Usual guide is either ignore it completely or knock of at least 2C from all temperatures. And from the “You couldn’t make it up” department, there’s talk of privatising the Met Office. Now what idiot would buy it? This of us with brains, go to Jo for our forecast. Can I have one of those spades? It’s been so bloody wet here SE Australia the ground has become soft enough to actually dig for the first time in 10 years. ( in my yard anyway). Hang on, belay that, it’s started raining again, can’t go outside. Well Andrew, this southern townie has a spade and used it last winter to clear my bit of pavement during the big freeze (as did both my neighbours) despite the dire elf ‘n safety warnings. I look forward to another nice cold winter here in suburban London, if only to kill off the slugs and snails, otherwise I’d have to poison them and upset Mr Monbiot and the Eco-Guardianistas. Does anyone know if Dahlias have a big future in a colder post- global warming England?